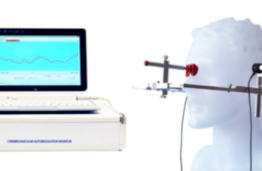 Non-invasive ultrasonic “time-of-flight” (TOF) method for cerebrovascular autoregulation (CA) measurement is based on the transmission of short ultrasonic pulses from one side of the skull to the other and dynamic measurements of the TOF of ultrasonic pulses. The TOF depends on the acoustic properties of intracranial blood, brain tissue and cerebrospinal fluid. First non-invasive, continuous, accurate, precise and reliable real time monitor of cerebrovascular autoregulation without the necessity of arterial blood pressure reference signal.